Coming until the entrance, there is a brand new interphone beside the door. Pushing the button, after a moment, there was a voice like an old lady answered. The voice, was somewhat brightly surprised. How to break the ice, Kiko thought while waiting. Uncle Kyoichirou, was standing in the light of the entrance. There was no white hair the last time they met, there was just a bit mixed in. He was three years younger than father so he is close to 50. However, the gentle expression, is just like before. Finally calmed, Kiko bowed her head. [i'm sorry about that. It's because of this spring, my duty changed, I still haven't updated the register of names. It's probably because of that. Anyway, please come in. Uncle closed the door. That sound, made a profound echo inside the house. Kiko said, Leaning her back on the living room sofa. There was a door in the corridor leading from the entrance to the inside. This living roomt must be at least 10 square meters, and couldn't guess the entire area of the house. Uncle answered, with Auntie preparing the tea, with a fond look in their eyes. nice to see we are still going. have i put enough pages for you or need I record some more images with my camera? I really can't remember what the last scanned (or photographed) page you made, but I based this on the pages I transcribed, which is up to page 27.
i remember this from some time back it was a alot of text but not much pictures i think yuki was gonna design the pages for them and wasn't sure if he wanted to take on the project. Lost Unit, you wanted to scanlate them but remember the pages are just text so no scanlating can be done. But I just thought, I don't know if I mentioned it back then, but there is something that can be done. it can be compiled into a PDF file. that can be considered 'scanlating' it in some fashion because it is presenting it as it was presented in the novel and i think that is what you meant when you brought it up? In that case, you'll have to let me know if the pictures are good enough for you to use. if I even photographed them, they may be a bit blurred and distorted. can you work with them and straighten them up? What we really need in this project is an editor. When I say editor, I mean the true purpose of an editor, which proofreads the translations, not just somebody to photoshop. Anybody can just slap all this text and pictures together, but will take a dedicated editor to clean out the paragraphs for more readable english. After all is done, as Ryuki said, can be saved as a pdf file, with all the artwork intact. when you come to think about it an editor would able to make sense of the paragraphs and i know once translated sometimes the phrases not match with so many variations . It easy for me slap the text after you guys have done all the hard work onto pages didnt really think this one through enough i think. 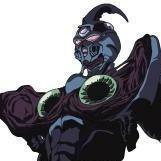 Artwork to this Guyver novel can be found on the Guyver Solution Web site. if I get time i'll continue it. I love that the novel is going on, but i confess the story has me a bit confused. If this a new character? I'm trying to place her in the earlier chapters in case she has a run in with the Guyver but i can't place it. Uncle put it out of the way. Before a reply was given, there was a moment. Uncle answered in laughter. But, it was somehow forced. His brother Tatsuo, after graduation high school, he was employed in the same company after the introduction of his uncle. It was said that he was adopted by the main office, they don't know his definite area of work. Wow, sounds like big brother works for chronus! just a couple of things if anyone cares to help..
it seems as if that is what is being implied???? Without thinking, he looked up at the girl. from the design of the badge on her school uniform he could see she was in highschool. She was carrying a large vinyl sports bag. This seemed unusual he thought, Which district did she come from?, is she visiting a relative? The still young police officer, teased the school girl. there weren't many courteous girl like this around here, but there must still be places like that. Her looks were not bad. Her black metal framed glasses suited her. The girls reply iwas not suspicious. It didn't look like she had ran away. The police officer pointed his finger to the map on the wall. After listening to his explanation, the girl politely bowed her head. The officer watches the girl walking in the evening street. He realised that he forgot to ask her name, then he thought that there was no need for it. In the outskirts, there is a place called Mount Narisawa. Although it is called a mountain, it is merely a slightly elevated hill, just a week ago, there was a long haul truck driver killed on the pathway of the mountain side. It might be an urban legend about a giant beast tearing it apart. The most bothersome thing is that the upper echelons have notified that the area be sealed off, and there was no way to investigate it. There were even rumors that the cargo was highly classified national information, the real situation is unknown. Because of that, the suspect still hasn't been caught. There were also those who conceal themselves in fear, too scared to talk. The police have also strengthened their patrol. He never would have thought of trying to find out more about the place she was inquiring about. Walking on the brick road covered by the high arcade, Naganuma Kiko drew a sigh. After arriving in Tokyo, this was the second time she had talked to someone. The station personnel was the first one at the private railway in the Shinjuku station, and then the police officer. It was her first time in the capital, and she asked her classmate about the route. This girl, who went on vacation in the capital, went to concerts and to watch movies. she had said that ,[ if you go to Tokyo and you talk your normal way you won't be able to communicate properly], she was worried, but somehow managed. The skyscrapers of Shinjuku and even the houses on the streets, were a big difference compared to her own home which continues into the residential district. In front of the station were the confusing masses of people going home, the wave of people walking in the shopping district began to break through, and it suddently became dark. in front of the arcade was a large highway. The cars heading towards the center of the city continuously zoomed by. The atmosphere of crossing the highway and the street was different. The area with a wide site was connected to the old apartments. Confirming the markings on the telephone pole, Kiko reached the estate she was seeking. It looked like an estate built a long time ago, with the narrow winding alleys. she came to face many dead ends and by the time she finally found the house, it was already sunset. The surname [Naganuma] was written there. There was a thick wood inbetween the next houses. Pushing on the concrete wall fence, there were various kinds of small trees. Between the door, a thin deciduous tree was growing. she went inside and saw the house of her uncle for the first time. It was a 2 story western styled house, concrete walls, with ivy growing in the north side. There was a window in what seemed to be like an attic. He was standing there alone in the bright spot, and later went into the dark area of the window. There looked to be only one light, which seemed somewhat lonely. Coming up to the entrance, there was a brand new intercom beside the door. Pushing the button, after a moment, a voice like an old lady answered. There was no white hair the last time they met, there was just a bit mixed in. ã€€He was three years younger than her father so he is close to 50. However, the gentle expression,wais just like before. [i'm sorry about that. ã€€It's because of this spring, my duty changed, I still haven't updated the register of names. ã€€It's probably because of that. ã€€Anyway, please come in. Uncle closed the door. ã€€That sound, made a profound echo inside the house. There was a door in the corridor leading from the entrance to the inside. ã€€This living roomt must be at least 10 square meters, and couldn't guess the entire area of the house. Uncle answered, while Auntie was preparing the tea, with a fond look in their eyes. Uncle answered in laughter. ã€€But, it was somehow forced. After his High school graduation , her brother Tatsuo, was employed in the same company after an introduction by his uncle. ã€€It was said that he was adopted by the main office, but his definite area of work was unknown to them. On page 20, I think that is fine. The author is actually putting emphasis on the "usage of words". As for page 21, It's was saying that there was a rumor about a woman peeking from the window while hearing the sound of a violin. She is talking about another house which she remembers. Or were you referring to the "being rough" part? It means that she can get rowdy as much as she wants. Forgive my rudeness but any new updates on this ? I know it's been almost 4 years but I wonder because many websites went down like guyversolution and I can't find this novel anywhere except here so if anybody still have the scans I would be grateful if you share them also I found it on Amazon as I saw Jess searching for a second one I believe the seller come from this website suruga since the price is the same. *Edit: Found another thread where Jess gave a Mega link, many thanks to her ! Anybody still interested in getting this translated? It's been too long since I last stopped and I no longer have the reference materials to continue. So if anyone is interested, just let me know. Otherwise, I'll deem this as dead. Yuki posted the novels in a thread just below this one. is it the same book or a different one? Okay, here is a disclaimer. I don't know why I didn't notice it before, but the girl's name is Noriko, not Kiko. I don't know where that came from. I wasn't probably paying attention then when I was translating those, but the girl's name is definitely Noriko. Additionally, I've tried to rephrase the sentences to be more palatable to English speakers, instead of literally translating word for word. Hopefully this will make it easier for whoever is going to edit this. Noriko's tone was now like interrogating. Uncle couldn't say anything and just kept quiet. Noriko was a bit calm, which surprised the uncle a bit. Noriko said without any expression. Uncle said a lot of things, but none of those registered in Noriko's ears. But there was one thing that kept on ringing on her head. Noriko was guided in a small room up a few steps from the first corridor. Even with Auntie's gentle words, she can't help but lower her head silently. When lying on the bed, the tiredness of the whole day suddenly came out. However she didn't feel like sleeping, her nerves were strangely awake. There is a window on the foot of the wall that is as tall as the ceiling. The one seen from the door is this one. A window that doesn't open - or rather it was fixed. I wonder if it was by chance that I entered this room, such doubtful thoughts lingered. However, what Noriko felt was not despair. It was anger towards herself. It was because Noriko now knew here brother was dead. -Last Thursday, there was the death anniversary service of father. With mother being hospitalized, the only ones left in the household was only Noriko and her younger brother in the second grade. Relatives living nearby and neighbors came and help out, but after the service has been completed, everyone became so busy suddenly. She finally slept in the deep of the night, her brother's fall shook Noriko up. Being tired, Noriko's tone was ill-tempered. Brother was employed in a pharmaceutical company. He would definitely come back on the day of the funeral service, but without knowing the reason, was absent this year, it made them worry. Rarely meeting him, the younger brother was a bit afraid of his older brother. With the lights on, I pulled my disappointing brother to the altar room. Looking about, there was an incense lit on the altar. The ashes hasn't even fallen yet. The deceased father was fond of recollecting local folktales. While still small, she heard the stories very often. Among those, there was a story about the dead meeting their immediate family, and it was told countless time. Usually they come back to ask for something or tell them something. She deemed those stories as foolish, since these came from the mouth of her father. The younger brother must have been dreaming. But there was something that made this uneasy. By chance she called the office and they said that his current location is unknown. She thought about asking her uncle, but she couldn't explain what happened here, and she doesn't know his current department. Even the address on the New Years card sent during the previous years came back. At that time, there was no mistake that brother came to visit. There's no way that he would not return home. There was no way that uncle had any resentment. After father passed away, and mother being confined to the hospital due to illness, it was uncle who introduced brother to that company. The money that brother remitted every month was significant that we thought of it as nothing. It if weren't for the uncle's recommendation, he wouldn't be receiving such a high salary. However, uncle himself said it. If only it were a different job. What was brother doing. No, there is no point on thinking about that. Even that last part did not make sense. During that night, if only Noriko got up, she might have heard something. When Noriko woke up, she crossed the room, and ascertained that the key on the window is lock. She took off her glasses and placed it on the table. Then, planted herself on the bed, covered with futon and placed her face on the pillow. The sound of crying could not be heard. When she woke up it was already morning. She took out a mirror from her bag and checked if it looks like she'd been crying. Just then her Aunt came calling. Oh, by the way, do note that I am having trouble discerning on how the story is being told. I'm undecided if it was being told in the perspective of Noriko or through a third person. Sometimes you will notice I translate this based on Noriko's perspective, other times through a third person perspective. The reason behind this is Japanese grammar is ambiguous when it comes to these things. Most of the time they write things in context so a literal translation will definitely confuse anyone unfamiliar with Japanese grammar. It might be a good idea to have an editor decide on the best perspective to keep the flow of the story consistent. I get confused sometimes so this confusion might also carry over to the reader. Would appreciate if you guys have any comments or suggestions. I think if it talks from a third person at any point, then maybe that is the right one. I say that because the ambiguity sometimes comes when pronouns are omitted etc. I think that makes sense?